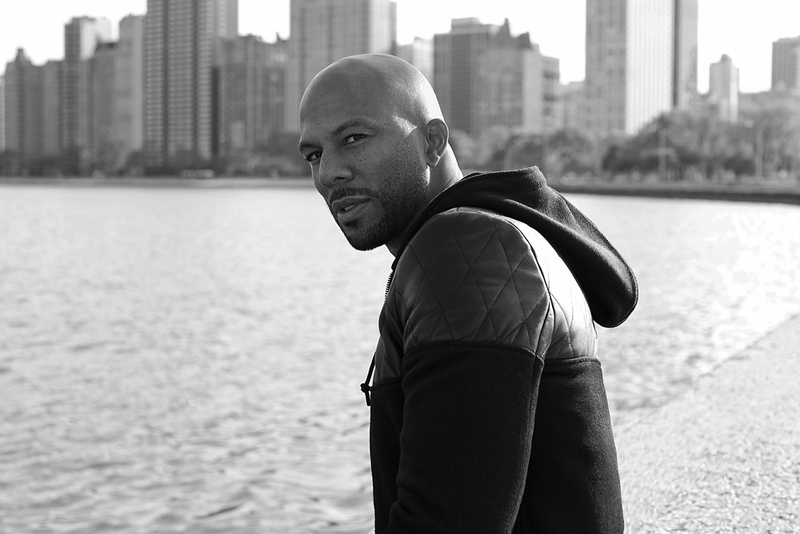 2015 Oscar nominee Common will serve as headlining performer at Global Green USA’s 12th Annual Pre-Oscar Party and Patron Dinner. The artist, nominated for “Best Original Song” for Selma’s “Glory,” will take the stage alongside a special performance by Makana, with DJ sets by KCRW’s Jason Bentley and DJ Syrena. Hollywood’s elite activists, eco-luminaries, creative professionals, political and business leaders, and preeminent global environmentalists will join the performers at this sustainable Hollywood celebration. 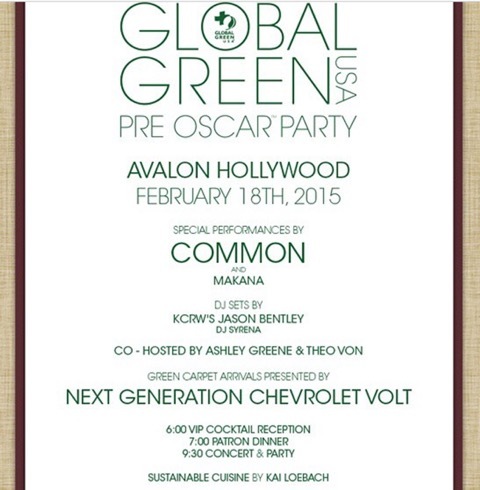 Global Green USA will commence Oscar Week with its flagship Pre-Oscar Party on Wednesday, February 18, 2015 at AVALON Hollywood. The zero-waste event will toast the organization’s ongoing and widely successful efforts to identify smart solutions to climate change and advance green lifestyle choices on a global scale. This year’s Global Green USA Pre-Oscar Party host committee will entertain Hollywood’s most iconic and recognizable industry leaders as they experience the all-new 2016 Next Generation Chevrolet Volt, enjoy a specially curated organic dinner courtesy of Kai Loebach, and relish in an exclusive post-dinner reception. General admission and VIP tickets for this event are now available for purchase at www.globalgreen.org. To receive event updates follow @globalgreen and use the hashtag #GreenPreOscar. Founded twenty years ago as the United States affiliate of Green Cross International, Global Green USA is dedicated to helping the people, places, and the planet in need through catalytic projects, transformative policy, and cutting-edge research. The organization’s signature programs include greening affordable housing, schools, neighborhoods, and cities as well as rebuilding communities that have suffered from the impacts of climate change, sea level rise, and environmental degradation. As the world enters a new generation of heightened environmental consciousness, Global Green USA is proud to announce its landmark new phase of development, aptly titled Global Green USA 2.0. Within this new and critical juncture, Global Green USA will scale its global social impact exponentially over the next twenty years, by focusing its ongoing advocacy and community work to protect human health, improve quality of life, and safeguard the planet for future generations. Global Green USA 2.0 will help nations across the world implement effective strategies that advance green urbanism to increase access to healthier, more vibrant communities. Additionally, Global Green USA 2.0 will foster educational programs that cultivate a greater collaborative resiliency and response to the ramifications of climate change. Global Green USA is grateful for the support from the following sustainable brands: Lux & Eco, Ashley Morgan, Bently Enterprises, Energy Upgrade California, Defiant Whiskey, De Loach Vineyards, One & Only Resorts, Pureology, Chantecaille, and Veev Spirits.